Boiling is a faster cooking method than steaming or roasting and, when properly timed, produces sweet, firm, perfectly cooked moist lobster meat. Because it is a high heat cooking method, timing your lobster to check for perfect doneness is crucial to avoid overcooking. Serve boiled lobster while it is still hot, or let it cool and store in the fridge to use for salads and sandwiches. Boil lobster in a pot that can comfortably hold all of the lobster and the cooking liquid. Use a 4 to 5 gallon sized pot for 6 to 8 pounds of lobster, and use at least 3 quarts of water per 1 1/2 to 2 pounds of lobster. Season the water with sea salt -- roughly 1 to 2 tablespoons of salt per liter of water -- or with herbs and aromatics, such as onions and carrots. Bring the water to a rolling boil, 212 degrees Fahrenheit, before adding the lobsters to the pot. Insert the lobsters in head first to kill them quickly, which will help keep the meat tender. There is no need to cover the pot, but make sure that all of the lobsters are fully submerged in the boiling water to ensure even cooking. Stir the lobsters halfway through the cooking process. It will take roughly 8 minutes to fully cook a 1-pound lobster, with each 1/4 pound requiring 1 to 2 minutes extra cooking time. So, a 2 pound lobster will be fully cooked 12 to 13 minutes after it is fully submerged in water at a rolling boil. 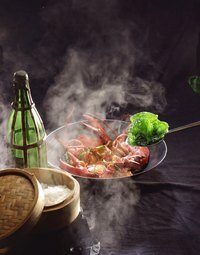 Lobster is fully cooked when the meat turns an opaque white and the flesh separates easily from the shell. The tomalley will turn green and any roe will be bright red and firm. If the roe is still soft and green-black colored, the lobster is not fully cooked. The internal temperature will read 180 F. When cooked, the lobster shell will turn bright red, but this is not an indicator of doneness, as this can occur before the lobster is fully cooked, especially with larger lobsters. Once the lobsters are removed from the water, let the lobsters rest for 5 minutes before serving. Remember that they will continue cooking even when they are removed from the heat. To stop the cooking process immediately, place the lobsters in a bed of ice. Cooked, whole lobster can be stored uncovered in your fridge for 1 to 2 days. Lobster pieces -- shelled or unshelled -- can be stored in an airtight container in the fridge for 2 to 3 days.Serve boiled lobster still warm with melted butter and lemon wedges, or separate the meat from the shell and toss with freshly cooked pasta and a spicy tomato sauce for a light, fast, weeknight meal.